"No man is free who is not master of himself." Fox & Pathe have debuted the official UK trailer for a film called A United Kingdom, starring David Oyelowo and Rosamund Pike as a married couple. 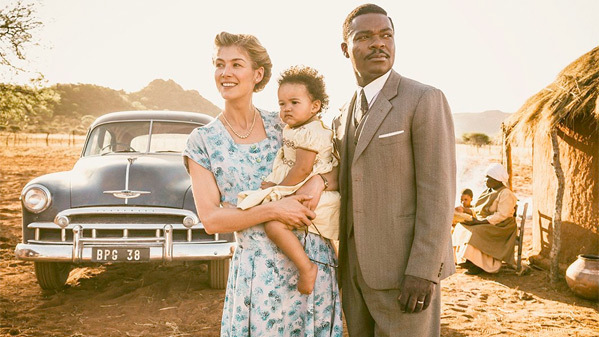 The film tells the true story of Seretse Khama, the king of Bechuanaland (modern Botswana), and Ruth Williams, the London office worker that he married in 1948 in the face of fierce opposition from their families and their governments. This isn't the only film this year about a controversial interracial marriage, as Jeff Nichols' Loving also tells of a story of a marriage that upset many people. But love is love, and that's what is most important. The cast in this one includes Tom Felton, Laura Carmichael, Jack Davenport, Charlotte Hope, and Jessica Oyelowo. As usual, Oyelowo looks like he's giving another magnificent performance. The film tells the incredible true story of Seretse Khama, King of Bechuanaland (modern Botswana), and Ruth Williams, the London office worker he married in 1948 in the face of fierce opposition from their families and the British and South African governments. Seretse and Ruth defied family, apartheid and empire - their love triumphed over every obstacle flung in their path and in so doing they transformed their nation and inspired the world. A United Kingdom is directed by English actress-filmmaker Amma Asante, of the films Belle and A Way of Life previously. The screenplay is written by Guy Hibbert. The film will play at the Toronto and London Film Festivals, before opening in UK theaters starting on November 25th this fall. No US release date is set, so we're not sure when it will open in America. Anyone interested? Shame this is coming out near LOVING, which looks like the superior film.